The days are becoming shorter, the nights longer and the temperatures lower… summer will soon bid its farewell and we shall welcome a new fall season. What better to reminisce on those warm & fun filled summer days than some photos of Dollfie Dream Kyouko under the bright summer sun. Shot these images of Kyouko in a grass field on two separate occasions, once amidst the blooming daisy flowers as seen above, and once after the grass was freshly mowed short. 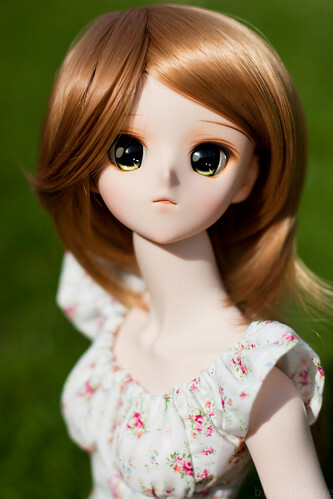 Hope you enjoy these summer photos of Dollfie Dream Kyouko. Adore this look for Kyouko, I recently changed her eyes and wig which transformed her into a whole new doll… must confess it’s hard getting used to her new look. Will make photos of her new appearance soon. Posed Kyouko with a small narcissus to give her something to interact with. This peasant top and shorts are designed by Puppy52Dolls. Had already showcased Kyouko wearing it before, but it has also been worn by Shizuko as it fits both the DDII and DDS body type. 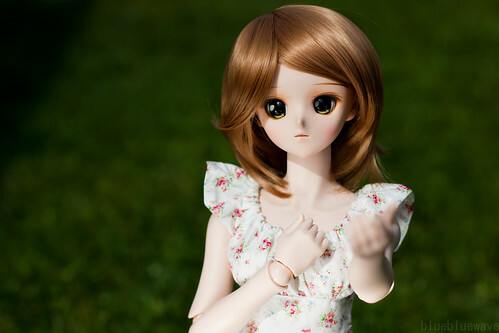 You can see more of my Dollfie Dream photography on Flickr. Those really are nice pairs of eyes you got for Kyoko there =3 Are they Volk’s わかば色eyes? Yes, those are Volks Animetic Type G わかば (green) eyes. Didn’t think they would suit her so well and still kind of miss that look on her now that I put in some other custom eyes.